Much like Lucky Star and Azumanga Daioh, Seitokai no Ichizon is your slice of life comedy with parody elements from popular animes and typical anime humour. 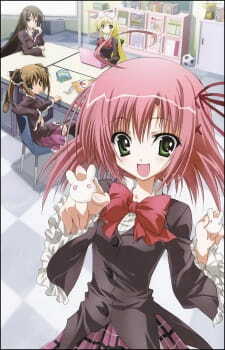 If you have watched Lucky Star then you will definitely enjoy this anime. What makes this anime similar to Lucky Star is the usual anime parody elements seamlessly and subliminally inserted into the scenes of every episode. If you are a huge anime fan and a total otaku, you will instantly recognise these inside jokes and parody elements. If you are not, you may have a hard time enjoying the anime or understanding the nature of interaction between the characters. There really isn't much to talk about story-wise as everything seems to take place in the student council room and rarely in other places. Also, the anime breaks down the fourth wall in the anime which also provides some humour to the audience. In the end though, this is just one big slice of life anime with many random events. The art style was actually quite good for a comedy anime. Unlike Lucky Star, you do get nice detail on backgrounds and characters. Also, the animation and illustrations were quite smooth and fluidly transitioned. The characters all looked cute, but rather generic. Voice acting was not bad for all of the characters. They all had unique voices stereotypical of their character representations. You can easily tell apart between them without even watching the screen. The theme songs were quite good and catchy. The anime features only a small number of participants, so you do have to put up with them till the very end. Of course though, the main character is a guy named Sugisaki Ken, which is a naive, lively guy that dreams to have his own harem, however the girls usually put up with him and his egoist attitude. The other characters are so stereotypical of your average anime containing the small, cute, naive tsundere girl that always gets picked on, the shy, quiet type that doesn't express her true feelings much, the athletic, loud girl that is fearless in expressing her opinions and finally the mysterious, sadist girl that takes pleasure from harming others. Overall, it was a decent funny anime to watch. You really must have watched a lot of popular anime shows to actually fully understand and enjoy what is going on. If you don't, you may find the jokes and events a bit random or boring. Other than that, it was a well compiled anime from start to finish. Apparently a sequel is in the works and won't be coming soon till much later. Not much of a story here since it is strictly a slice of life comedy anime situated in a student council room. Wonderfully illustrated and animated. Characters all looked cute but rather generic. Voice acting was distinct between the characters. Theme songs were decently catchy. Limited character development and generic portrayal of personalities were a bit of a letdown. Well, you you don't understand the parody elements, you won't enjoy watching this anime. It was enjoyable and some parts were laughable. There are some better comedy anime out there if you are willing to try.